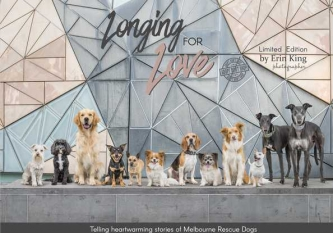 ‘Longing for Love’ is Erin’s second limited edition photobook in her series of Melbourne dog books. 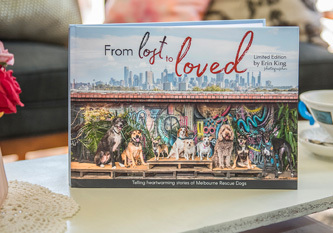 The book tells the heartwarming adoption stories of 60 Melbourne Rescue Dogs. Each dog’s story is accompanied with beautiful natural environmental portraits illustrating their new found happiness with loving their families. Most importantly the book is a fundraising project to help support three Australian based animal rescue groups: Greyhound Rescue Victoria, Puppytales Rescue and Rehoming Inc and Melbourne Animal rescue. In addition to the participants session fee, 10% of each book purchase is donated to these groups. You can buy this book on my website here. For a limited time, during pre-sale, you can complete the collection and also buy the first book ‘From Lost to Loved’ for 1/2 price at $75! What an absolutely stunning book! Erin has done such a magical job and we just can’t thank her enough! Erin is such a pleasure to work with, the whole process was so much fun and the end result is pure perfection. We feel so incredibly privileged to have been involved. This book is absolutely gorgeous…and I’m not just saying that because my dog is in it!! It’s a book of love and hope and celebrates the wonderful rescue stories of these beautiful dogs. And the photos just show all the different personalities of each dog so well 🙂 We had such a fun photoshoot with Erin and the final photos were beyond what I expected. I now have these gorgeous photos to keep as memories of my senior dog, DeeDee, forever. Anyone who loves dogs will love this book!! And to know that this book is supporting animal charities too is so awesome!! This book is so lovely, and for such a good cause. Erin’s photographs are stunning and the entire project is put together with so much heart and passion. My dog Rupert was thrilled to see himself in print, and it’s such a special keepsake that we will cherish forever. Even if you don’t have a dog featured in the book, it’s a wonderful book to read – the stories are so heartwarming and go to show how rewarding and loving rescue dogs can be. A Beautiful treasure of a book! So many beautiful stories of how these gorgeous dogs got adopted! A real treasure for any dog lover and great stories also for children to learn about adoption of dogs and how they can fit, adapt and become part of the family! Beautiful!!! If you are thinking of getting family photos, Erin is amazing to work! Highly recommend! Professional, Friendly, Patient and just a really nice person! !